Houston Weight Loss Center is a medical weight loss and liposuction specialty clinic with locations in Houston and Katy Texas. We are dedicated to helping you look and feel your best. Since 1996, our team of weight loss experts has helped thousands of Houstonians reach healthy weights* and develop weight loss strategies through effective weight loss programs. We emphasize lifestyle change conducive to maintaining the weight loss. Through our comprehensive medical weight loss programs that are customized to your needs, our team helps you reach the weight goals appropriate for your age, gender, and height*. Our medical weight loss programs use healthy diets combined with FDA approved prescription weight loss medications, non-prescription weight loss supplements and weight loss counseling from our medical staff who are experienced in obesity treatment. Our centers also offer the latest technologies in body sculpting including laser assisted liposuction, Smartlipo. This technique can remove as much fat as traditional liposuction without having to “go under” general anesthesia*. Our medical director, Dr. John Bergeron, is a cosmetic surgeon who specializes only in liposuction. He is one of the most experienced surgeons in the country at performing laser assisted liposuction. 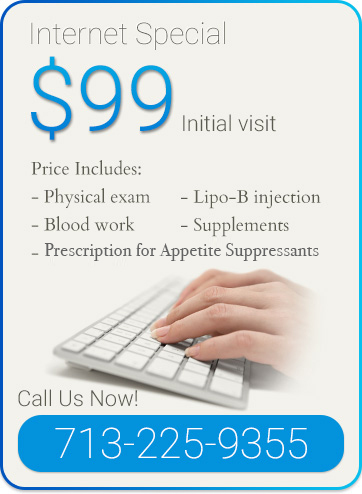 Houston Weight Loss Center work hard to keep you comfortable and relaxed during your visit. We focus on giving you top-notch service in plush and tranquil surroundings. Our facilities are designed and decorated with you in mind. Our elegant spa environment will help melt away the worries of your day and keep you focused on what’s important – you! Expect to leave Houston Weight Loss Center feeling calm, collected and even more beautiful than when you first arrived. We look forward to seeing you!